GH and PS are two houses positioned side by side on a single property in a suburban neighborhood. The houses are oriented to take advantage of the property’s park-like setting with features including an extensive garden and a salmon stream. The intent behind the building and landscape designs was to blur the boundaries between indoor and outdoor spaces. 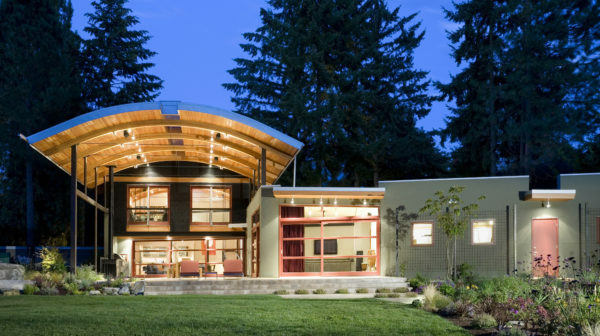 Curved roofs and similar exterior materials were used to establish a dialogue between the two houses. Healthy home materials and practices are used throughout both homes; Constructed from a unique concrete building block (ICF) manufactured from wood chip fibers covered in a Cementitious coating the exterior building envelope is weather resistant but vapor permeable. Jeff has monitored the energy usage of the homes since their completion and calculated an EUI in the mid 20’s kbtu/sf which at the time the homes were completed exceeded the guidelines of the AIA 2030 challenge for high performance building for a single a family residence.